Delightful sweet taste. Suitable for lacto vegetarian diet. Kosher - KLBD-D. 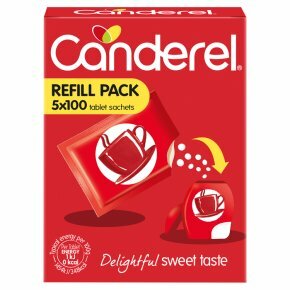 Instructions for use 1 tablet of Canderel® = 1 teaspoon (4g) of sugar 0 calories as sweet as 16 calories How to fill your dispenser: Carefully open the lid of the dispenser at the lever slot indicated... Tear open one of the 100 tablet refill sachets and empty the contents into the dispenser... Firmly secure the lid of the dispenser. Canderel refill packs can only be used in Canderel dispensers.